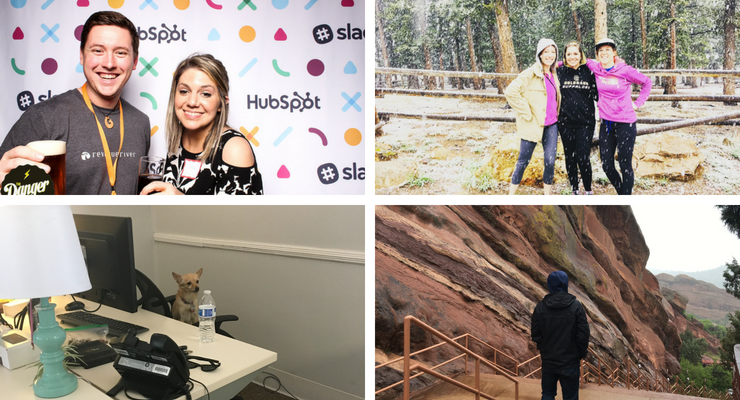 Pictured Clockwise Starting at Top Left: Director Marc Herschberger and me at HubSpot Partner Day; Director of Sales Enablement Amanda Daume, me, and Sales System Architect Emily Cray on a snowy hike in May 2018; Marc giving me a tour of the Red Rocks concert venue in Denver; Tinkerbell in Director of Search Nicole Lawrence's office. The title of this blog post has SEO benefits for our blog, sure, but it’s also an apt title for this chapter in my career. After working at other agencies and working my way from Specialist through to Director in the agency world, I had started to become fascinated with the parts that make up a finely tuned agency, the way a horologist obsesses over the mechanics of the intricate systems and parts of time-keeping devices. 1. Learn what it takes to be at the top. 2. Contribute to growth and success within that environment. I was brought on to Revenue River as a Digital Strategist to help develop our client marketing strategy while also identifying good fit clients for the agency, namely, organizations looking to get from point A to point B with digital. How Do You Choose Which Agency to Work For? Recognized by software partners, former and current clients, and external evaluators (e.g., award judge panelists) as being exceptional. Well-developed processes that solve for client goals and internal agency efficiency (this was especially important to me as someone interested in systems). Consistent results. A lot of agencies can produce great results a handful of times. But have they done it consistently? Must be an agency that specializes in technologies that I’m comfortable with so I can make an immediate impact (HubSpot, Drupal, or WordPress). I figured that if I start my search with agencies that match these criteria, I could then spend the last portion of my job search finding an agency who meets these goals by following values and systems that align with my own. My search for my next agency home followed a similar process that you might use to hire a HubSpot agency. I checked the HubSpot Partner Agency listings in the directory, started at the top, and worked my way down (luckily as it turns out I wouldn’t have to go down very far on that list). I read reviews on Glassdoor, G2 Crowd, and Clutch.co, and watched testimonial videos from clients. Revenue River is a high-performing, data-driven, successful, determined, talented, and fun agency. What Do All HubSpot Agency Partners Have in Common? Let's examine the HubSpot Agency Partnership program is before talking about how Revenue River is an exemplary agency in this group. Ultimately I ended up gravitating toward HubSpot partner agencies during my search. The reason is the effort put in by HubSpot to cultivate a community of marketers, enabling them to achieve growth by providing them with the technologies, methodologies, and support to implement change. Rather than focusing solely on their technology, HubSpot equips users with a mindset that transcends the technology and empowers marketers to think about systems holistically, and the holy grail of agency services delivery: demonstrable ROI. Brian Halligan, CEO of HubSpot, has mentioned in at least two talks I’ve attended in-person (including this talk, "From BDR to CEO: Fireside Chat") that HubSpot’s Agency Partnerships are critical to HubSpot’s ability to continually succeed amid a sea of sales and marketing tech. Access to unlimited support from strategy to utilization of the tool. HubSpot has multiple tiers within its Agency Partner Program including Diamond, Platinum, Gold, and Silver. The tier is a signal to you of the volume and quality of execution of the partner. While Diamond is the highest tier, and Revenue River is in the Diamond Tier, I’d never say to you that this automatically makes us a better fit. It does tell you though that Rev Riv has a consistent track record of success, which I listed in my criteria above in my search for a new agency home. What Makes Revenue River Different from Other Agencies? The framework of people, processes, and technologies is fitting to use when evaluating agency success. I’ve seen agencies try to build their strengths in all three areas. That’s a great place to start, but if the pieces don’t work together in unison toward the same goals, then you can’t be efficient. I’ve also seen agencies try to stack one of the three areas of people process and/or technology in order to compensate for weaknesses in other areas. You might see this in an agency who wants to throw a lot of technologies at your problem but doesn’t demonstrate how this helps you move the needle on important organization-wide goals. Revenue River has integrated people, processes, and technology in such a way that when these factors are applied toward a marketing goal, the result is a nearly fail-proof, and always effective system. I’ll explain how each component works within Revenue River and end by demonstrating how this creates a formula for success. What Are the Processes in Place That Help Revenue River Win for Clients? There are four distinct features of our processes that make it easy for us to win for clients. 1. Alignment between people, agency, and clients. Our company-wide goals are primarily focused on hitting client goals and doing so effectively. Once a week, as a company, we review these goals together to report on successes and failures and plan for the future. Each department also has goals that relate directly to the company-wide goals. And each person has goals that relate directly back to the department goals. This concept of total organizational alignment has been articulated well by Elon Musk and was presented at HubSpot’s 2017 INBOUND conference. The basic premise is this: let’s say you hire people with an effectivity quotient of 9/10. If each of those 9/10’s are pushing in different directions, the net effect of their efforts is going to be 0 or -2 or 4. Either way, the quotient is going to be a. low and b. unpredictable. Slide from live keynote by Dharmesh Shah @dharmesh at INBOUND 2017 (www.aligningvectors.com). On the flip side, if you align these highly effective people toward the same goals throughout the organization, the net effect is going to be a 36. Or a 108. Or a 1,543.94. It doesn’t really matter the exact number other than that your effectiveness is going to be a. high and b. consistently predictable. Many agencies are stuck in a familiar pattern of playing catch-up, responding to the latest crisis or putting out fires. These tasks are urgent and important and belong in the diagram below in Quadrant 1. We spend some time in there, but it’s not the goal. Continual learning. We set aside time on a regular basis to learn new techniques and technologies to help you achieve your goals. Process review. We set aside time to review our processes to ensure that we are set up to deliver maximum impact. Department development. We set aside time to ensure that our departments remain on the cutting edge of their respective areas of expertise and are staffed appropriately to deliver wins. Campaign planning. We spend time building out campaigns that are thoroughly researched so there is no guesswork when it comes time to execute and deliver on your most important goals. 3. We endure the growing pains of the ever-changing digital landscape so you don’t have to. Ouch. An email arrives in your inbox saying that the future is AI and the funnel is dead. You might quickly delete that email and pretend you never saw it. You simply don’t have the budget or time to delve into those changes to the marketing and sales landscape. That’s where an agency like ours is useful. We are set up in such a way where we can take the sucker punch of a new technology and we’ll use our collective hivemind to figure out how each new change fits into our digital strategies and ensure we get up to speed on best practices so you can benefit from these changes. In my short few weeks here I've already been tasked with learning about, testing, implementing, and reporting on a new sales tool. 4. We will pivot ASAP. Recently, we received feedback from a couple clients that while they appreciated the sky-high results we were able to drive for them, the first month or two of set-up was a little painful while they waited with bated breath to see how the results would turn out. As a result, Eric Pratt, the fearless Managing Partner, used our weekly meeting time to introduce an idea of a launch pad strategy to ensure that the first 30 days of a new client's campaign drive immediate value to increase client satisfaction. The systems immediately snapped into place. Department leads and contributors set to work determining how they could contribute to the success of this new initiative. Rather than a sense of foreboding, there was excitement in the air as the entire team got onboard with the plan and realized the creative ways we could attack this problem. Agencies, even HubSpot Partner Agencies, should at all times remain technology agnostic. The focus should be on driving results for clients, and if a technology does not serve that purpose, then other technologies should be considered. Foundational. Your HubSpot set up includes elements like a COS, a CRM, blogging, content strategy map, social media publishing capabilities, paid ad capabilities and more giving you all the tools you need to map and measure your digital strategy. Flexible. HubSpot is constantly adapting to the needs of marketers and the expectations and interests of buyers online and offers integrations with other marketing and sales tools. Measurable. HubSpot allows you to measure results from beginning to end in order to capture important information like ROI, customer acquisition cost, and channel attribution so you know how you’re doing and how you can improve. With HubSpot as the foundation, we augment HubSpot depending on the needs of our clients with different technologies. We are always vetting new technologies to introduce to our clients that meet the criteria of effectiveness, quality, and fit. Databox. Databox pulls all your data into one place, so you can track performance and see insights in real-time. Drift. Drift uses artificial intelligence and bot technology to revolutionize conversations on your website. With Drift on your website, you can turn your traffic into qualified meetings using the bots 24 hours a day, 7 days a week. LeadGnome. LeadGnome mines email replies to harvest valuable pieces of intelligence. By scrubbing reply data it grows your database, reducing manual entry, and gives salespeople insights with critical timing relevance. TwentyThree. A video management platform to run video marketing campaigns across various channels, including their own website, webinars, and live events that integrates directly with HubSpot. PandaDoc. A document automation tool that streamlines the way organizations create, send, and track sales documents, leading to higher close rates and shorter sales cycles. SeventhSense. Seventh Sense's precision email system analyzes your existing data to determine the optimal send time and frequency for each contact. Read: using AI to actually determine when is the best time to send emails. Lucky Orange. Lucky Orange is website consumption software. It records how people engage with your website with multiple formats available for web teams to gain insight. The data it harvests can be used to feed website design strategy and UI/UX. Each client gets a customized technology stack that matches the goals of the campaign. We also leverage the technologies in our own marketing and sales to test run and ensure quality and best practices before implementing in a client campaign. Who Works at Revenue River? The reason the entire system works is the people that work at Revenue River. Applicants are selected through a rigorous hiring process that determines qualities like collaborativeness, desire to learn, problem-solving, and transparency. Within that there’s a lot of diversity both in skill and personality, creating a dynamic, lively culture. There is a great amount of trust and accountability among the team. Challenges are welcomed and embraced by this carefully vetted team of agile, technology-hungry specialists. Managing Partner, Eric Pratt is a digital strategy savant with a vision that inspires and a biting humor that induces laughter. He’s no stranger to the truth. His transparency and trust in his team reverberate throughout the agency culture. Upon acceptance of my new position, in my first week, I flew out to Denver from my hometown of Boston with a dream and a cardigan to meet my new team. An important side note on Denver public transportation, which I took from the airport out to the Revenue River offices in Golden: as a Bostonian, it can only be described as “quaint.” The trolleys move at a pace similar to one that you might find at a local children’s zoo; the purpose is to entertain and let you see the sights rather than actually get you from one place to another efficiently. One of the highlights of my trip was when I pulled into the Golden train stop, which, again, had a noticeable lack of people, save for a single person. And that person was our Director of Marketing, Marc Hershberger, wearing a Revenue River sweatshirt, looking exactly like the photo on the website. All of these hints might have been enough for me to know who he was. However, in a gesture of welcome that would become a theme for the week, Marc had also created a sign that said JENNA on it, as if he were my valet, with a huge grin on his face and a hug ready for when I departed the train. Upon arriving at the office, I was handed a beer (tip to new hires: always accept the beer offered to you by Marc when you first arrive. I messed that up. ), invited to a meeting to discuss department goals, given books (books! ), and brought up to speed on the technologies and processes I would be using. From one on one meetings to team meetings to outings, I got to know everyone as whip-smart world-class experts and hilarious storytellers. Their warmth that week made it so I could go home and be a successful remote employee, carrying those relationships over to long distance. What’s the Future of Revenue River? Revenue River, through its carefully constructed people, process, and technologies stack, has set itself up for scalable success with clients and as an agency. Employees like myself will have access to cutting-edge digital tactics, a team of experts, and a lifelong learning curriculum as we keep up with the digital landscape. Due to our structure, we can add more clients and team members without skipping a beat to create an even bigger impact. With more people and resources at my disposal than I’ve had to date in my career, I look forward to the opportunity to think through those “Q2” areas I mentioned above. What does an ideal digital system look like? How can we embrace change while still creating systems that are effective? What will marketing and sales online look like in 2 years? I also look forward to seeing what HubSpot does with the Agency Partner program. Each year we are given more resources and tools to help us and our clients succeed. And each year we hope to step up to the plate even more and deliver on that investment made in us and our clients. 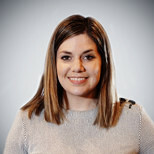 Jenna develops digital strategies that align vision, tactics, and execution to achieve client goals. She takes the time to carefully understand a client, their organizational goals, industry, and KPIs. After working with clients in technology, blockchain, standards setting, non-profits, associations, software, publishing, and R&D, Jenna was excited to join the Revenue River team after seeing the results they drive for clients.